Words matter. I first learned about this novel through words, the written words within columns by the Kirkus Reviews and the New York Times about exciting 2013 summer reads. Words can be used to convince. The details in these reviews persuaded me that “Lexicon” has a good chance of being a story I would greatly enjoy, and that it would be conveyed in a manner that would be unique and compelling. 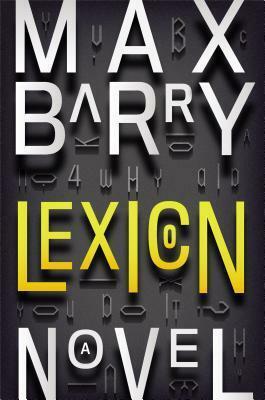 Lexicon is a novel generally about words, language, the process of drawing meaning from symbols. It is also about how words can be used, manipulated, and selectively disseminated to persuade, to control. Words can be weapons; in the case of the plot here, quite literally, in a world where modern-day ‘sorcerers’ that are naturally captivating and persuasive are trained in the lexicon and practice of wielding words. They call themselves “poets’ and adopt names of famous literary figures, and their abilities impart them great power. Like all powers, the power over language can corrupt. The story begins by jumping directly into taut action. Fantasy in a strict sense, sci-fi in its use of biological and psychological explanations for apparent ‘magic’, the novel mostly feels like a thriller. The reader is dropped into the action immediately and it hardly lets up until the conclusion. Through this Barry does extraordinarily well in keeping detailed explanations from the reader, allowing one to adapt to the ‘universe’ of the story and its internal ‘rules’ , letting one gradually figure out what is going on, which characters are ‘good’, which are ‘bad’, and that such a dichotomy may not even really exist. Yet the reader never feels lost or misled. With an internally consistent, exciting plot and complex, relatable characters the novel would qualify already as a great easy ‘summer’ read. However, it is also filled with interesting psychological ideas about how we as human beings gather, receive, process, and project information – in terms of the individual, social network platforms, the government, and the media. Through it all it becomes clear that Barry has an intense love and respect for language: its beauty, its power, its potential for abuse, and the myriad dangers associated with either limiting how information is conveyed/received or easing restrictions on access to private information. In this final aspect it reminds me of themes found in other fantasy literature, such as Le Guin’s Earthsea series, where the knowledge of someone’s private name gives a wizard complete control over that being. This is of course an old concept in the myths of sorcerers and magic. Yet recent news of extensive data gathering on people by governments and corporations in the name of ‘safety’ or ‘efficiency’ remind us that this concept symbolized in mythology is quite the reality.